Whether it be for an avid investor or for an occasional follower of the pharmaceutical industry, significant FDA events pose some of the greatest interest, and act as some of the most explosive catalysts of change in a company’s share price. For a small biotech located anywhere in the world, a marketing approval granted by the FDA is arguably the most contested prize in the industry. As a result of the 2009 – 2015 Patent Cliff, industry observers can expect increased crowding on the FDA calendar, as many new drugs are currently being developed to offset cliff losses. 2012 was one of the record years for drugs reaching the market, with 38 new medicines approved by the FDA, a new 16 year record. 2013 appears equally promising, with 22 scheduled FDA decisions so far – half of which are anticipated in the first quarter. The vibrancy of the biotech industry is reflected in the performance of the NASDAQ biotechnology index, which, having returned ~35% growth in 2012 (more than 4 times that of the Dow Jones), continues to soar above the other indices (fig. 1). On the FDA calendar are numerous events ranging from Investigational New Drug (IND) applications down to the very final stage of a New Drug Application (NDA) or a Biologics License Application (BLA) which, if successful, grants a new medicine approval to be marketed and sold in the US – the world's largest pharmaceutical market. The date by which the FDA aims to deliver its marketing verdict for an NDA or BLA is called the Prescription Drug User Fee Act (PDUFA) date, following which the applicant may be granted or refused marketing approval, or requested to provide additional documentation and/or conduct further studies. The PDUFA date carries crucial importance as it can signify the birth or death of a new medicine. To a pharma and biotech investor, an FDA marketing decision can potentially crash or soar a stock. PDUFA dates normally carry a significant stock runup up to the date, and PDUFA-related intraday surges of up to 300% are not unheard of, which should be incentive enough to closely follow, and understand, the FDA calendar. The next three months (January through March of 2013) anticipate a more-than-usually saturated FDA calendar, with a total of 11 PDUFA dates (table 1). Salix Pharmaceuticals and Santarus Pharma kicked off this year’s marketing approval list with the anti-diarrhoeal drug Fulyzaq and the Ulcerative Colitis treatment UCERIS, which was granted approval two days ahead of schedule. 6 drugs are still lined up to face FDA’s advisory panel this quarter. It is common for the FDA to announce 3-month PDUFA delays, and several of the drugs awaiting a verdict have already undergone such extensions. 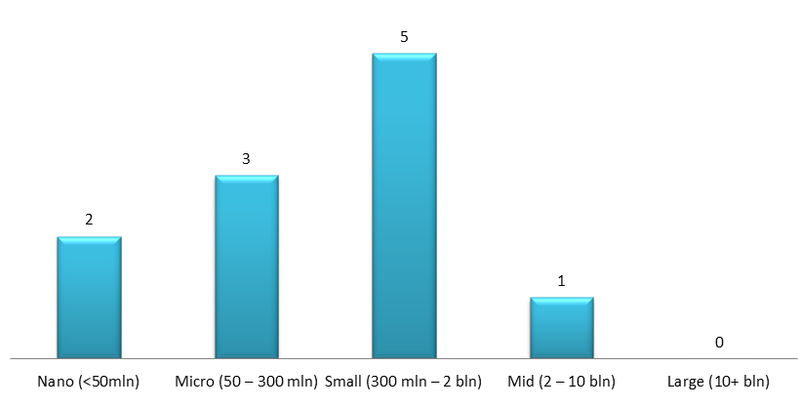 Statistically, only 35% of new drug applications receive FDA approval in the first review cycle[i]. It is likely that a number of drugs on the Q1-2013 calendar will face similar delays, partly due to increased application volume this quarter. Just over half of the drugs (6 out of 11) on the FDA calendar this quarter are novel chemical or biological entities, whilst the rest are non-innovative reformulations and repositioning of formerly approved drugs, combination therapies, etc. 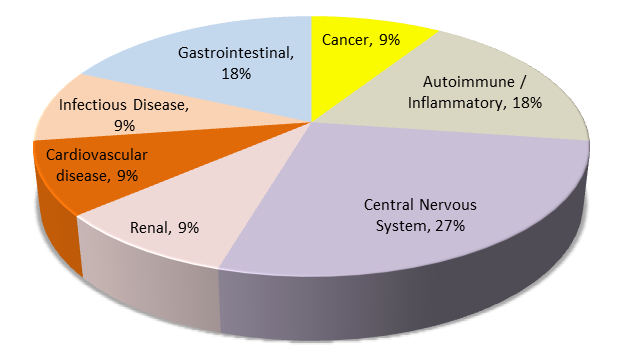 In terms of therapeutic area, nearly a third of NDAs in Q1 adress Central Nervous System (CNS) disorders, followed by gastrointestinal and autoimmune/inflammatory targets (fig. 2). Only one of the drugs, Dynavax’s HEPLISAV vaccine, is a biologic. Interestingly, the Q1 2013 FDA calendar does not feature Big Pharma players, with the exception of those which have partnered with the drug developers covered in this report. In what has become the standard prior to FDA applications, all of the companies featured in this Q1 2013 report are public. The majority have a market capitalization of US$ 2 billion or less (fig. 3), with only one mid-cap company – Salix Pharmaceuticals, worth US$ 2.69 billion. Read on about individual company description, stock quotes and prognosis in Bioassociate's latest free white paper here!